The story of the NZ 2nd Division’s is one of the longest and toughest of any Allied unit. 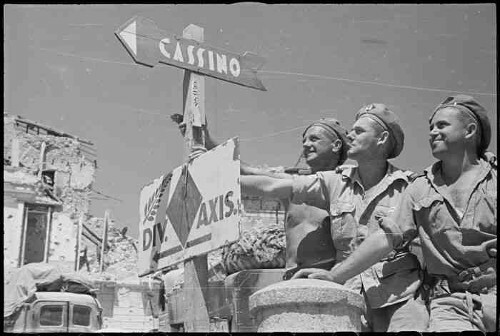 For four years the division battled its way across Greece, Crete North Africa and Italy, facing some of the best units the Axis had to throw at them. They fought through deserts and snowy mountains, thousands of miles from their home with little chance of seeing their loved ones again until the job was done. As a Kiwi myself I wanted to put these battlers on the table for my games of Chain of Command. The starting point was the already-published lists for British forces. Like all Empire troops they were organised and equipped almost identically to the British Army, but there were some differences. There’s a decent list for the North African campaign, but nothing for Italy. Italy gets a bit overlooked by wargamers, who seem to jump straight from the end of the desert war to D-Day for British, US and Empire forces, when there was actually fighting all the way through. The transition shows in these lists, with the Kiwis originally entering Italy organised the same way they were in the desert (lots of AT guns and vehicles, fewer infantry) and by the end of it they look much more like a typical Late War force (PIATs, Wasps, Fireflies, etc). The Division itself is an interesting unit. Originally an infantry division it re-equipped one brigade with Sherman tanks while in the desert, doing so by actually retraining the infantrymen as tankers. It also used some unusual equipment in Italy, such as Sherman tanks and Priest SP gun carriages as “kangaroo” APCs. Modified universal carriers of the Maori battalion in Italy. One seems to feel invincible enough to have painted a large white target on the side for the Germans to aim at. Throughout most of the war the division was commanded by Bernard Freyberg, who is still a household name in NZ. I used to go swimming as a kid in a pool named after him. And speaking of Kiwi household names the division’s 20th Battalion also boasted Charles Upham, the only combat soldier to ever have been foolish enough to earn himself two VCs. That’s an act made even more remarkable by the fact he survived earning both medals and several escape attempts from Colditz and went back to farming in NZ. Legend has it he wouldn’t let anyone bring a German car on his land to the day he died. – The 2″ mortars variously have 2/3/4 crew depending on the source. Is this deliberate? – Is there a reason the list uses the Boys ATR? The Official History of New Zealand in the Second World War 1939–1945, Italy Volume I: The Sangro to Cassino, pgs 33 & 34 would indicate that the changeover to the PIAT occurred at the same time as the Staghound provision. – What weapon choices does the Recce section in Universal Carriers have? 2″ mortars in most CoC lists come with a 2-man crew, but my own reading suggests that where present the OC’s batman was expected to join the 2″ crew as a third man. I don’t think it makes a big difference either way. I’ve not read anything about 4-man crews myself. Excellent spot on the issue date for the PIAT, I’ll amend the list right away. Universal Carriers can carry a Bren, 2″ mortar or a PIAT as per the recce section in the main rulebook. I’ve also seen some still in use quite late mounting Boys rifles. It seems 2nd NZ had a bit of a habit of bodging just about any surplus weaponry they could find into their carriers, hence the proliferation of 30 cal and even 50 cal guns in pics. I see I’ve not explained the 2″ Mortar crew question very well. The Infantry Platoon has 3 crew, the Motor Platoon has 2 crew & the support list has 4 crew. From the earlier answer, am I right in assuming the 4 crew in the support list is an error? – Did the Infantry Platoon really have no assigned AT weapon? Ah yes, typo in the support list! Cheers. Scale of issue for the PIAT is a bit hazy. If you wanted to include it at the platoon level and pull a couple of men out from rifle sections to man it I don’t think it’s going to be a problem for game balance. I’ve taken the view that it wasn’t a weapon routinely used and that platoon commanders can deliberately include one if they feel the need (ie: get it off the support list with a dedicated crew). I reckon the most wallet-friendly way into Italy is to start with the later half of the campaign and used miniatures wearing normal temperate uniforms, that way it’s just a matter of sorting a bit of terrain. Having said that, the Perry plastics are a good cheap (£20) way of doing Brits in shorts for Sicily. Yep, I’m inclined to do just that. I do like the Perry plastics, but would have to sort support weapons (ie, the PIAT) for those in any case, so may as well just start with later. Any suggestions on where to source 28mm Staghounds? All I’ve really found are Bronco (1/48) and the RTFM/diewaffenkammer (28mm) ones. Looks like Blitzkrieg do some as well, but they’ve only got 3D renders on their site and I’ve never bought anything from them. I can’t vouch for the quality. – The Stuart Recce is support List 3 on the late version , List 4 on the early version. – The late version Motor Rifle squad is identical in composition to the early infantry squad (List 4) but is on List 3. – The 50cal Universal carrier has HE listed as HMG in the late list, 10 in the early list. I’m assuming the 50cal is intended to be top mounted? – Boys AT Rifle entry in the early armory can be removed. PIAT can be added to both. – Staghound Mk II comes out as 3+3+6+1(wheeled)+1(MG) = 14. Staghound Mk I is 3+5+4(MG overides the HE)+1(wheeled)+2(Hull & Coax MG) = 15. Unless the Mk 1 has had a theme discount applied, they should both be List 5. Opinion follows! Feel free to ignore as you see fit. Depending on the reinforcement pattern of the NZ forces (trickle feed or complete formations?) I’d suggest that Regular should be an option on the lists, particularly the early list. Alternatively, leave it in to allow for those not using the Experienced Regulars (Veteran?) rules. I’m not sure that the pintle AA mounts on the Sherman & Firefly are justified. Written & pictorial evidence appears to indicate that the majority of Commonwealth Shermans in Italy had them removed/not fitted. – 50cal on Bren is a scrounged gun welded to the carrier so yes will be top-mounted. Not dismountable as no tripod was available. I’ve changed both lists to say “HMG” instead of HE 10, just to make it a bit clearer. – Boys AT rifle was already gone as of ver5 of the list, PIAT was in use by the time of their first action in Italy, although some Boys were still knocking about I don’t believe they saw much use and I can’t imagine wargamers having any reason to want one. – Both Staghounds now List 5, thanks. Re: reinforcements. It was trickle-feed, although given the requirement to ship them all the way across the world they arrived in pretty big batches. Experienced men were sent on furlough on several occasions, and rarely returned to their original unit, while casualties obviously created vacancies too. These were filled when a batch of replacements arrived from NZ. At times that meant that the battalions entered combat with a lot of green men, but they were generally less than 1/3 of the total number, with “old hands” making up the majority at all levels, right down to individual sections. That’s why I went for Experienced Regulars instead of Elites. Eighth Army in general were pretty tough and their years of experience in the desert should be reflected IMO. As for the AA pintle mounts, you’re probably right about that. I certainly haven’t modelled any on my Kiwi tanks. Sorry, should have been more specific again. The Arsenal Table has a guns listing down the bottom. The late list is missing the PIAT, the early list has the Boys and is missing the PIAT as well. Pedantic, but helps to have all the references in one place! As the 50cal UC is a non-standard vehicle, it’d probably be worth mentioning the intention for the top-mount for the 50cal in the notes/list description. With trickle feed for the reinforcements, I can see why you’ve chosen Experienced Regular for the majority of the time. I’m slightly unconvinced for the beginning of the time period though – somewhere between 1/2 &1/3 of the division was green (6000 on furlough, only ~1100 of those returned, so 4900 green in a division of 13k-18k : http://www.nzhistory.net.nz/war/second-world-war-at-home/hello-and-goodbye). You’re right, I didn’t bother to list the PIAT in with the guns and such. I probably should put that in the next version for completeness. I’m not sure where people would think you could mount a 50cal M2 gun apart from on top of a carrier! But it might be worth hunting down a photo for future versions. You’re talking about Orsogna re the reinforcements? The battalions that did most of the fighting were the 21st and 23rd. 23rd sent home 157 men and received 220 replacements who hadn’t yet seen action (27% of their strength). The high calibre of these new men is noted in the battalion’s war diary though, probably due to the fact training roles back home were now held by experienced combat veterans. Certainly the performance of 21st and 23rd against some tough troops at Orsogna showed they were still capable of going toe-to-toe with elite troops like fallschirmjager and defeating them. given that some of the Pint Sized campaigns rate units like 49th West Riding as regular on their first day of combat I’m willing to cut the hard nuts of Eighth army some slack! For 22 Bn in the period June-Sept 44 I’d probably use the early lists, yes. The only real action of note that would affect would be La Romola. Sure, but some of the pics of 50cals on UC have it mounted over the gunners position. Some pics also show just UCs with a single 30cal mounted there – and the argument would run that we’re treating those as the hull MG, so why not hull mounted for the 50cal as well? (In a way, the 10 HE entry was actually clearer what the intent was.) There’s also pics with a Vickers actually mounted in the gun port, so it’s not like there’s a lack of space! I think this one boils down to CoC rules – I doubt there was any noticeable difference to the troops using it whether it was mounted in the gun port, above the port or further back on the carrier. I hadn’t looked into specifics of where the reinforcements had gone – I’ll bow out of the argument on that one, pending more research. Your case is sound given the evidence so far! Having said that, I’ll run the lists through the CoCulator for personal use as Regulars – purely because I can’t convince some of my opponents to try the intermediate Experienced grading. Where a 30cal has been welded onto a carrier I wouldn’t treat it as a hull MG. WYSIWG applies here, I think. If your model has the gun on a pintle mount, then it’s a pintle gun, if it’s mounted in the hull (as some stuff was, even ATRs) then it’s a hull gun. Fire arc changes, but not the number of dice. Fair enough about regulars if your opponents aren’t convinced. 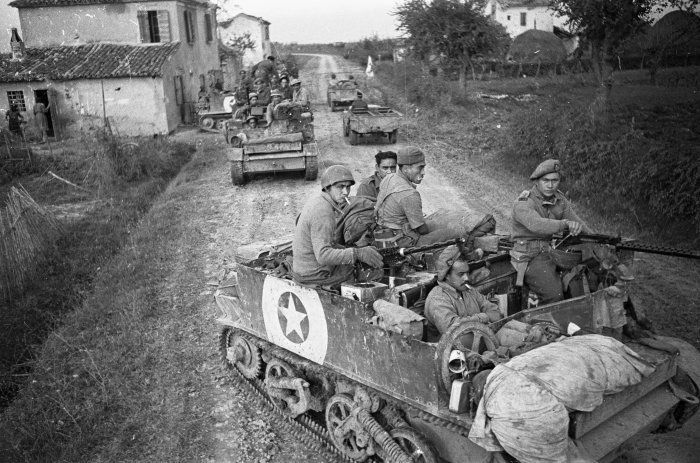 There’s evidence of the M10 Achilles being used in Italy: there’s pictures of British ones as early as October 44, see https://en.wikipedia.org/wiki/17pdr_SP_Achilles#/media/File:Armoured_Ramp_Carrier_03.jpg for an example. There’s a picture of a NZ Achilles in ‘Camouflage and Markings of the 2nd New Zealand Division – Part 2: Italy’ (Plowman, 2007) on page 42. No clear information on when they were provided that I’ve been able to find though, and the NZ picture is late enough that it potentially never saw combat. On the M10 Wolverines – http://nzetc.victoria.ac.nz//tm/scholarly/tei-WH2Arti-c19-1.html has them as delivered in June 44 and first used July 44. That puts them in scope for the support list for the Early list. Currently there’s no way to represent the ArmCav force in San Casciano, with the addition of M10s to the early list there’d no longer be a problem. That photo is in Trieste Dan, and given that 7th AT had been taken out of front-line fighting and were mostly doing indirect fire in the late stages I think your hunch that the M10 Fireflies never saw combat is probably right. The introduction date for the M10 does overlap the very end of the early list slightly. Feel free to use them in actions Jul-Aug 44 if you want. Armcav could be quite an interesting force to game with actually, it was like a mini armoured task force within an infantry division, something probably only 2NZ as a mixed division could do. That said, there’s still no evidence that it saw combat other than in indirect fire mode, nor that there was ever more than this single example. Interesting to note that the 17lb HE ammunition was available and apparently this wasn’t unusual enough to warrant comment. Might be enough to justify HE on the Sherman Fireflies as well? Yeah, that’s the problem with a lot of the terms wargamers use like “Achilles” and “Sherman Firefly”. The M10Cs weren’t called Achilles during the war, if they were called anything other than M10s it was often actually “Firefly”. You can hear the veterans calling them that in this video: https://www.youtube.com/watch?v=_B-sfUFWG8Y. The name Firefly wasn’t really used for the Sherman VC mounting the 17pdr as far as I can tell.